Hi everybody! Today I show you a really cute and up-to-date little project. 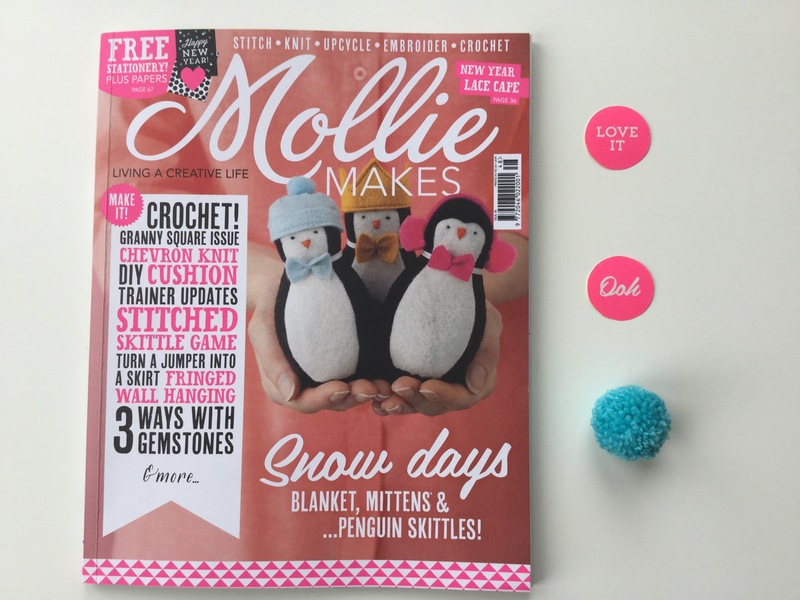 As minerals are popping up everywhere these days, I was happy to find a great pattern in issue 48 of Mollie Makes (my favourite magazine, as you all know). The original design was made for up-styling a plain jumper. This looks really great! 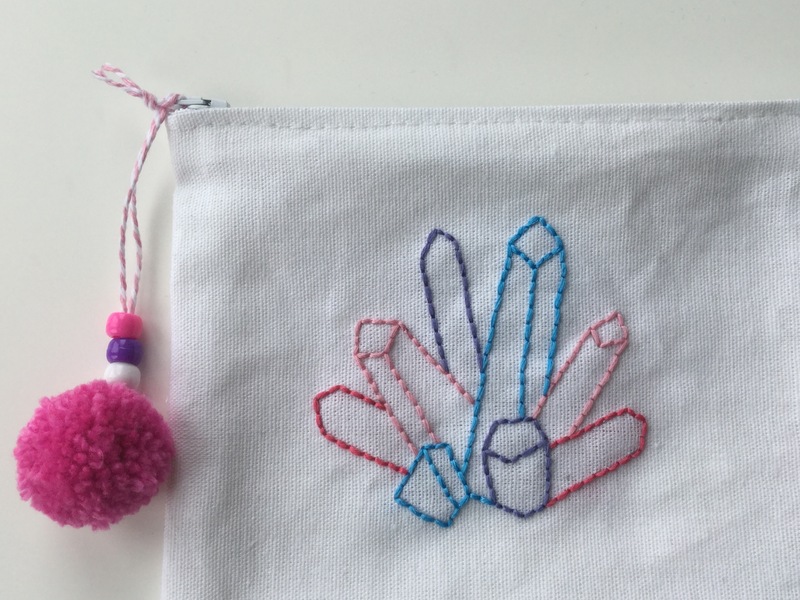 For I don’t have any jumpers for upcycling at the moment, I decided to sew a small zipper purse with the minerals design. I chose a white cotton fabric and embroidered the design first before sewing the purse together. For a cute finish, I attached a pompon at the zipper. I’m so happy with the result. Mollie Makes always inspires me in the greatest way. If you don’t know the magazine already, give it a try. If you love comtemporary crafts, bright colours and cute and quirky things, this is the perfect choice for you. It’s sometimes a bit complicated to get the current issue outside UK, but it’s worth it. I finally found a dealer here in Germany in my hometown, who gets it on stock- although almost 3 weeks late (seems a bit strange in 2015, but anyway, I’m happy to get it). A great and crafty Sunday to you all. Have fun and happy moments! Categories: crafts, embroidery, pompons, sew | Tags: crafts, DIY, embroidery, minerals, zipper purse | Permalink. Hi everybody! 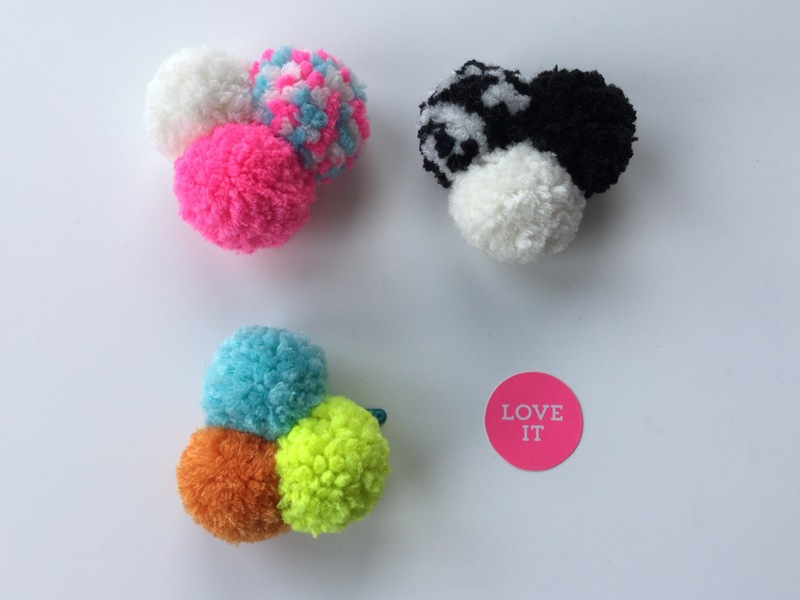 I just made some more of the cute pompon brooches and I’d like to share it with you. Crafting along these pompons while listening to the beatiful album “Days to come” by Bonobo is a real Sunday joy. I hope you have a relaxed and creative day too. Have fun and happy moments! Categories: crafts, jewelery, pompons | Tags: brooche, crafts, DIY, jewelery, pompon | Permalink. Hi everybody! This is my contribution against winter depression. Tomorrow I start my new job and I wanted to have a new bag to carry my lunch every day. It should be bright, colourful and a real eye-catcher in all this grey and unpleasant January weather outside. 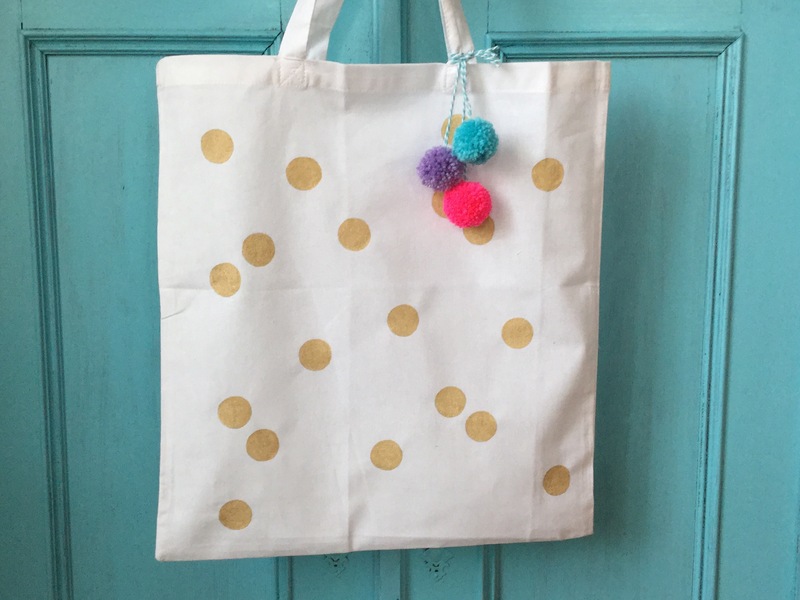 I decided for a white cotton bag and painted it with glitter polkadots. Yay! For extra brightness I attached small pompons in my current fav colours. Didn’t it turn out cute? I love it very much. – First iron the cotton bag. Then lay it out flat and insert the cardboard. – Draw the circles onto the fabric with thin pencil lines. I used a big button for it. If you’re not sure where to draw the circles you can make circle- templates out of coloured paper first and lay them out onto the bag. So you can play around with the positions before you finally draw the circles. – Paint the circles with the fabric painter. Let it dry completely an iron it from the backside. Now it will be fixed and washable. 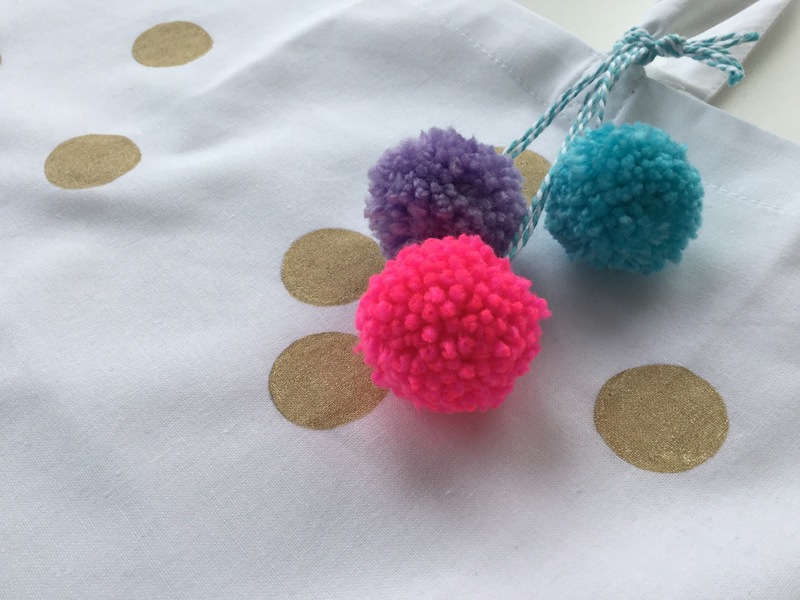 – If you like, make 3 pompons and attach them with Bakers Twine on your bag. I hope you enjoy this one as much as I do. Have fun and happy moments! Categories: bags, crafts, pompons | Tags: bag, crafts, DIY, glitter, polkadots, pompon | Permalink. Hi everybody! Yesterday evening I made this pompon brooche with some leftover yarn in bright neon colours. Really, I like pompons so much. They remind me of my childhood, they feel fluffy and in my favourite colours they’re a total eye candy. 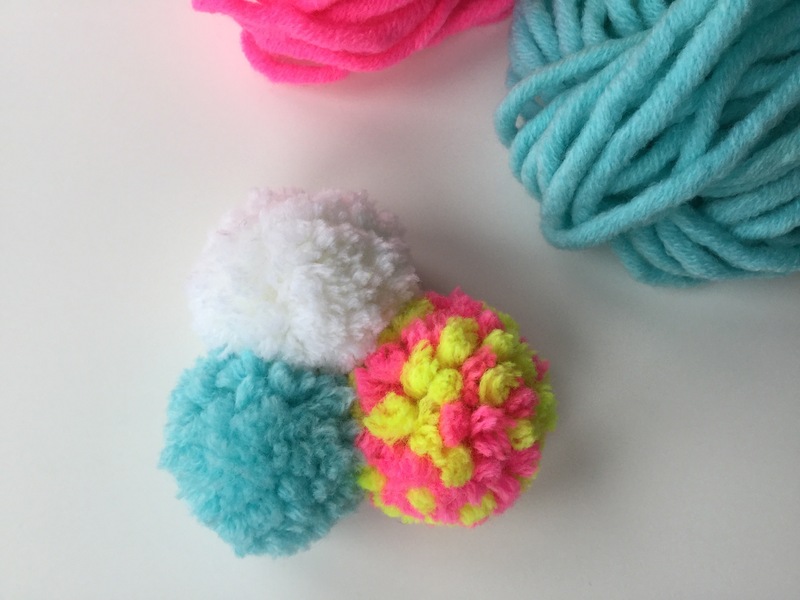 – Make 3 small pompons and cut them in shape for a neat look. – Tie the pompons together so that you have a small bouquet. – Attach a brooche pin on the back. It’s the easiest thing, isn’t it? I intend to wear it with a black outfit when I start my new job next week. Have fun and happy moments! Categories: crafts, jewelery, pompons | Tags: brooche, crafts, DIY, jewelery, pompons | Permalink. Hi everyboday! For it’s the last day of the year, I wanted it to end colourful. 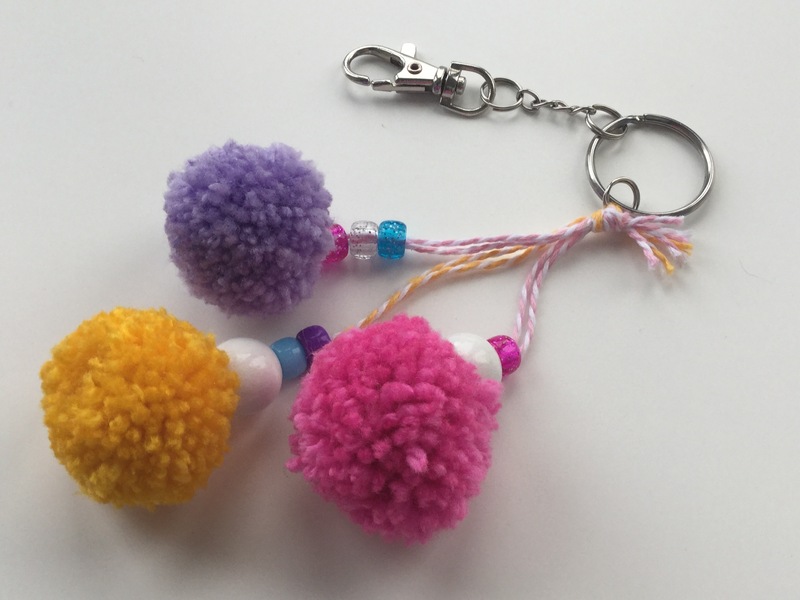 These pompon key charms were the result. Aren’t they cute? 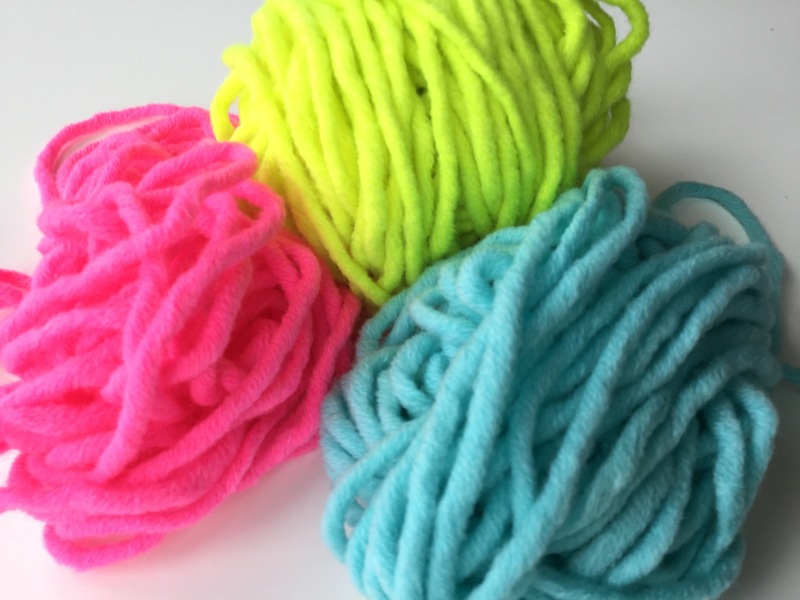 All you need is a bit of leftover yarn in candy colours to make the pompons. When you have three of them, cut them in shape for a nice and neat look. Attach Bakers Twine, in matching colours if you have at hand, and add some beads. Tie everything together – and that’s it. I wish you all a very happy new year full of inspiration, creativity and fun. Making beautiful things and following your inspiration is a great way to enjoy life – so keep on being creative and enjoy the new year as much as you can. Read you in 2015! Categories: crafts, pompons | Tags: crafts, DIY, keycharm, pompon | Permalink.